He is also: Percussionist and Singer for the D.C. based Mod dub Rockers; Thievery Corporation. (His other side projects include: Palm Fabric Orchestra, and, 8fatfat8). Raised in the Hawaiian Ocean, Frank Orrall is the Son of a Solar Physicist Father, and a Folk song singing Mother. Learning Guitar from his Mother, and a love of poetry and nature from his Father; Frank began to record a series of homemade solo cassette albums out of his bedroom in 1984, and released them on consignment at local record stores around Honolulu and Southern California, under the moniker; Poi Dog Pondering. Since then he has lived between San Francisco, New York, Austin Tx., and Chicago. Collaborating along the way with a wide array of fantastic Musicians & Co-conspirators; releasing 8 full length albums as PDP, and traveling extensively with them (and Thievery Corporation); For the love of Music, Prose & Adventure. Street Musician. Drummer. Guitar Player. Writer of Prose. Body Surfer. Collector of instruments, Record albums and Swim Fins. He Loves to Cook, Drink Wine & Play Music. Biggest Dream: To voyage the Pacific on a sailboat". Frank Orrall from Jorge Sanhueza-Lyon on Vimeo. "AMA" Solo Album of selected songs by other artists from Poi Dog Pondering's Frank Orrall. 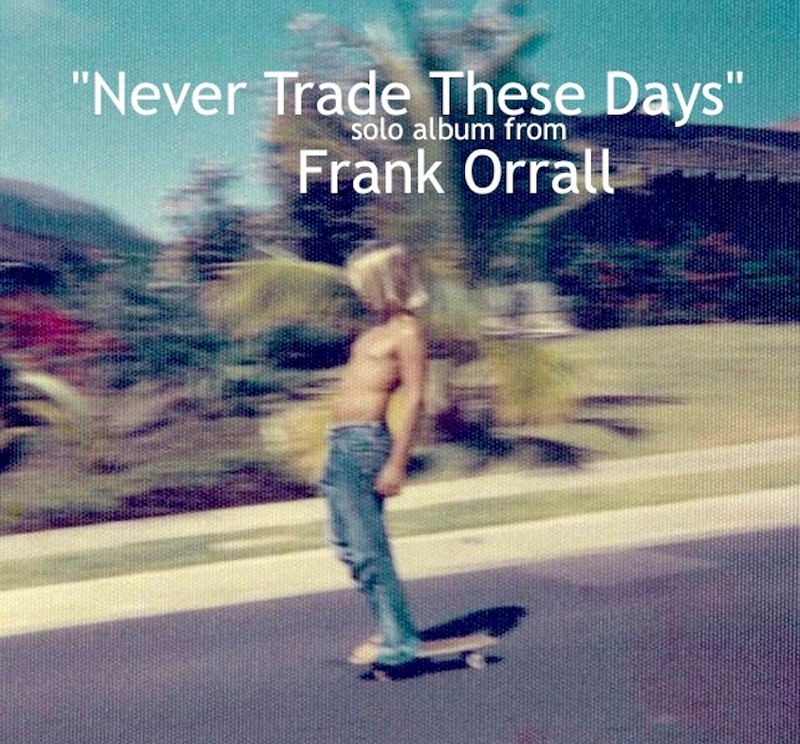 A hand made recording entitled: "Never Trade These Days"
"Every record is a new experiment. One of the major driving factors for me making this record was that I missed the simple process of how when I first started writing and recording music, at first on my brother's 4 track cassette recorder (and then later with a Fostex cassette 4 track I bought, and set up make shift studio in my bedroom). Don't get me wrong... I really, really love the proper modern recording studio; fully... to the maximum. However, I also love the original song idea that comes about when you are brain storming pre studio. The Home Studio. The first 2 PDP records where based on songs from bedroom recording cassettes (the 1st PDP cassette albums). There is a little magic that gets captured when the vibe is easy and loose. And with the advent of high quality portable recording gear, what we used to make as demos can now very easily be master recordings. Now more than ever, it is available to us to capture great quality recordings anywhere (and if the first take is good, which it often is.... you get to keep it:). Whenever PDP records in a proper studio we make arrangements with the owner of the studio for us to sleep on the couch or the floor if we need to. I like to sleep where I am recording so I can wake up and work when ever I want...& follow the ghost of the song no matter what hour it comes to me. So, for this record, I made a monk's bed in my living room studio & took my meals, coffee and wine at the mixing desk & slept 4 feet away from my recording equipment and in the room with all my instruments. It really brought me back the a really good place for writing songs; a gentile place where song buds can bloom, free from any expectations, except to just be their own unique selves. I am very happy to visit the original process again". PDP Hawai’i Brother and Sister, Frank and Abra, join forces for a special show in AUSTIN, Texas. The evening is centered around the Chicago House Music Conference and Festival, and the House Music Award for CHIP E.